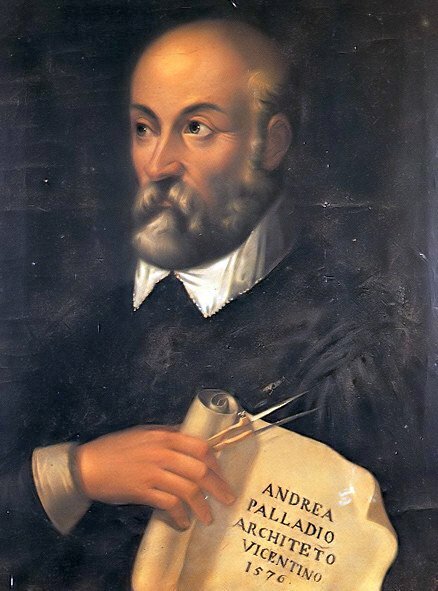 Andrea Palladio (Italian pronunciation: [anˈdrɛːa palˈlaːdjo]; 30 November 1508 – 19 August 1580) was an Italian architect active in the Venetian Republic. Palladio, influenced by Roman and Greek architecture, primarily by Vitruvius, is widely considered to be one of the most influential individuals in the history of architecture. All of his buildings are located in what was the Venetian Republic, but his teachings, summarized in the architectural treatise, The Four Books of Architecture, gained him wide recognition. The city of Vicenza, with its twenty-three buildings designed by Palladio, and the Palladian Villas of the Veneto are listed together as UNESCO World Heritage Sites. Andrea Palladio (pärisnimega Andrea di Pietro della Gondola) (30. november 1508 Padova – 19. august 1580 Vicenza) oli Itaalia arhitekt, üks lääne arhitektuuriajaloo mõjukamaid isikuid. Utbildning: Lärling hos div uppdragsgivare. Egna skrifter: Quattro Libri dell´Architettura - Fyra böcker om arkitektur 1570. Villa Foscari i Malcontenta di Mira 1572. Villa Barbaro i Maser 1549-1558. Villa Rotunda utanför Vicenza 1566 ca. Ombyggnad av torghallen i Vicenza 1548-. San Giogio Maggiore i Venedig 1566-1580. Kyrkan Il Redentore i Venedig 1577. Teatro Olimpico i Vicenza 1580-1584. Fullbordad av Vincenzo Scamozzi.